Recap: The Amazing Race Australia vs New Zealand, Episode 9 – "Dude, we don't want to go to your house." It is time for the penultimate Leg and teams will be flying to Buenos Aires, Argentina. At the airport, Sally & Tyson work with Daniel & Ryan researching flights in the business lounge. They specifically make a point to not share information with Ashleigh & Jarrod who think Daniel & Ryan merely leech off of whoever’s got the access and info. All teams are on the same flight via Frankfurt. Teams arrive in Buenos Aires and they must make their way to Estancia Las Betulas, a local polo ranch. Carla & Hereni and Ashleigh & Jarrod hurry to the taxis while Sally & Tyson and Daniel & Ryan go to the currency exchange where they get stuck in a long line. But Carla & Hereni and Ashleigh & Jarrod’s taxi drivers have no idea how to get to the ranch. That allows Sally & Tyson to arrive first and they open the clue to reveal the Road Block. For this Road Block, teams will drive a sulky carriage along a marked path to a polo field. There, they will dress and prepare a polo horse for competition. When the polo player approves, they’ll get the next clue. After a fast ride down the path, Sally and Daniel get started. After getting driven through strange neighborhoods, Ashleigh & Jarrod arrive at the ranch with Carla & Hereni in last. Ashleigh and Carla do the Road Block and work to catch up. But Sally stays out in front with Daniel next and Carla able to pass Ashleigh. 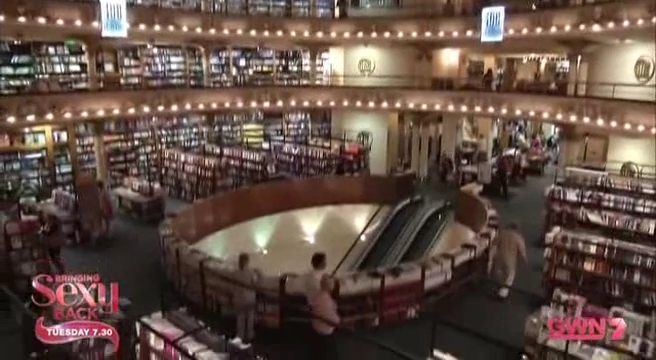 Teams must now make their way back into Buenos Aires and find the “most dramatic bookstore” which they must figure out is the El Ateneo Bookstore, a former theatre turned into a bookstore. Sally & Tyson arrive at the bookstore and find the Detour. In Tango, teams must learn and perform a tango routine. In Tribute, teams will be given clues that will lead them to two Argentinean landmarks; Diego Maradona’s home stadium and Eva Peron’s grave. For both Detours, teams must take a book containing information that will lead them to their next location after the bookstore. Sally & Tyson decide to do Tribute, but Tyson has to go pee first. They get help from a local who points them to the clue on page 197 of their book, directing them to La Bombonera. As they leave, Ashleigh & Jarrod arrive and they decide to do Tango. Daniel & Ryan arrive next. Daniel wants to do Tango, but Ryan says no. Daniel doesn’t want to get stuck in traffic again, but Ryan insists so they do Tribute. Carla & Hereni arrive just as Daniel & Ryan are getting information. They choose Tango, but then do not realize the book they need is right on the table they picked their clue up from. They waste a lot of time searching the entire bookstore. Sally & Tyson arrive at the stadium and they find a man dressed in a red and yellow kit. The man tells them in Spanish to look in the book they brought with them for the hospital where Diego Maradona was born. They need to come back to him with the answer. They have a local write down and translate the question for them. But since the book is in Spanish, Sally & Tyson go inside the stadium and have someone look up the answer on the internet: Evita Hospital. They think this is where they have to go next, so they hop into the cab. Ashleigh & Jarrod arrive at the Tango. They dress up and start learning the routine. On the way to the hospital, Sally & Tyson realize their mistake and they head back to the stadium where Daniel & Ryan are trying to figure out what’s going on as well. Sally & Tyson are careful not to help or give Daniel & Ryan any clues. 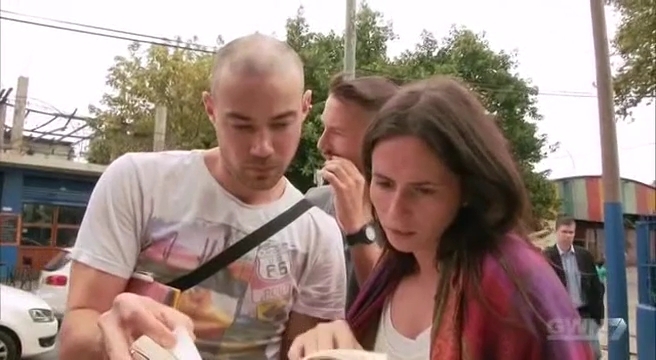 Sally & Tyson ask some new locals who explain that they need to find it in the book as do Daniel & Ryan. Carla & Hereni arrive at the Tango as Ashleigh & Jarrod attempt the routine once more. At the stadium, Sally & Tyson’s friends find the answer first, they show the soccer player and he gives them a picture of Eva Peron with a poem leading them to the cemetery. Daniel & Ryan are disheartened that Sally & Tyson did not help them. And when they get back in their taxi to go to the cemetery, it breaks down. At the Tango, Ashleigh & Jarrod finally get the applause and the next clue. They must make their way to the Argentina Rowing Club and row themselves to the Pit Stop at the Tigre Club. Sally & Tyson get to the cemetery and quickly find Eva Peron’s grave where they get the Pit Stop clue. Carla & Hereni give the tango a go and they get applauded on their first try, putting them now in 3rd place. Ashleigh & Jarrod arrive at the canoes and row themselves to the Mat where Grant officially checks them in as Team #1. They win a 5-star holiday package to Bali, Indonesia. Sally & Tyson will happily take 2nd place. 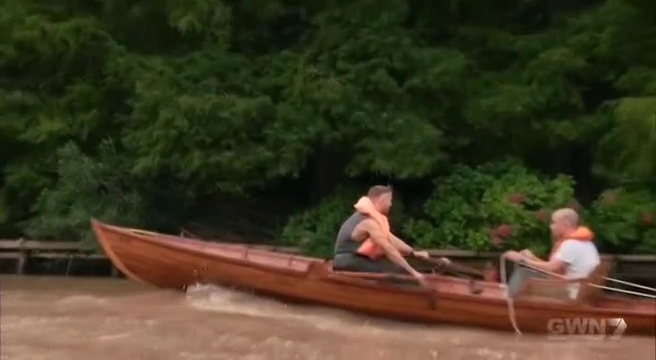 Carla & Hereni arrive at the canoe and they start rowing themselves… in the wrong direction. This allows Daniel & Ryan to catch up and eventually slip into 3rd place, officially securing their spot in the Final 3. That means Carla & Hereni, the last New Zealand team in the Race, is last and eliminated. This was definitely a much better Leg than the Croatia one. Lots of tricky clues, which is great to see. It is always nice to see teams have to use their brains to figure stuff out. The Road Block was okay. But the Detour was definitely interesting. Having to follow directions and having to get help from the locals as opposed to learning how to tango is an interesting contrast. 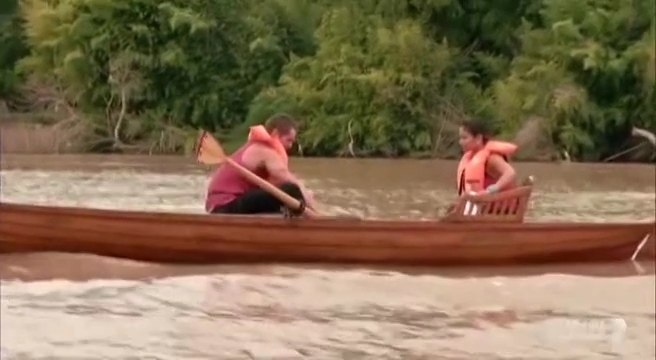 That final rowing to the Mat, you don’t expect anyone to mess it up like Carla & Hereni did, but it happened. Sally & Tyson, I think, are now my official picks to win the whole thing. Just the right combination of fun and skill make them the most rootable team for me. Carla & Hereni were really all over the place this Race. I wish they had been more of the feisty mums instead of almost falling forward half the Race. Their elimination was definitely their fault which just caps their see-saw Race. Daniel & Ryan at the Detour and being upset with Sally & Tyson was just bad. What was that? It was a little pathetic considering how well they’ve done on their own. And after laughing at Carla & Hereni having to work for themselves. They were lucky Carla & Hereni made their fatal mistake too. It was almost two disastrous Legs for them. Ashleigh & Jarrod are still moving along well and it was fun seeing Jarrod actually be the calm and composed one at the Detour for once. 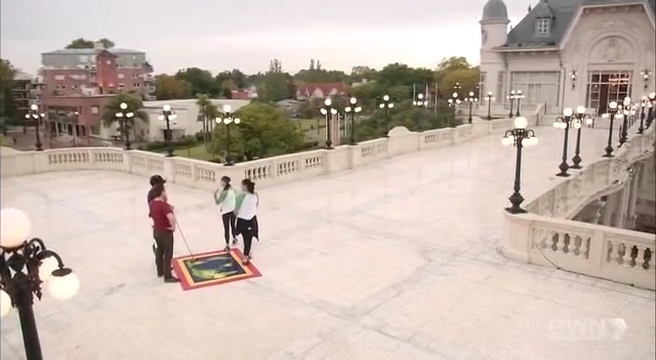 ← Recap: The Amazing Race Australia vs New Zealand, Episode 8 – "I can't feel my nadz!" D&R ‘slipped into third’, but I think that was more TV editing than reality! There were four canoes when A&J arrived, they didn’t show how many canoes when C&H arrived, but two canoes when D&R arrived (supposedly ‘last’).